Get on target using BSA 3-12x40 Tactical Weapon Scope. 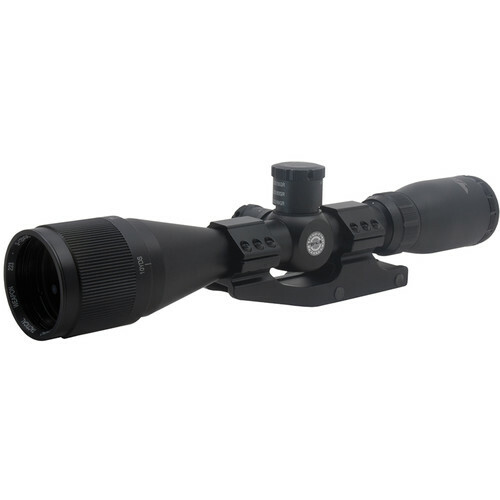 This telescopic sight provides you with all the necessary basics for engaging targets at different ranges and in many lighting conditions, thanks to a wider 40mm diameter objective. Its optical system features a 3-12x zoom for getting good close-ups on more distant targets, full anti-reflection coatings for improving image brightness and reducing glare, and a mil-dot reticle for precise target acquisition. The reticle can be adjusted to achieve parallax-free performance from 10 yards to infinity using the adjustable objective ring. The scope also has an aluminum housing with a 1" diameter maintube and ships with a one-piece Weaver mount for attaching it to your firearm. To compensate for trajectory changes due to wind and ballistics, its capped turrets allow you to make windage and elevation adjustments with 1/4 MOA intervals.